The 2019 Student Program will run from June 13 to August 11. The summer field season is broken up into a series of blocks. 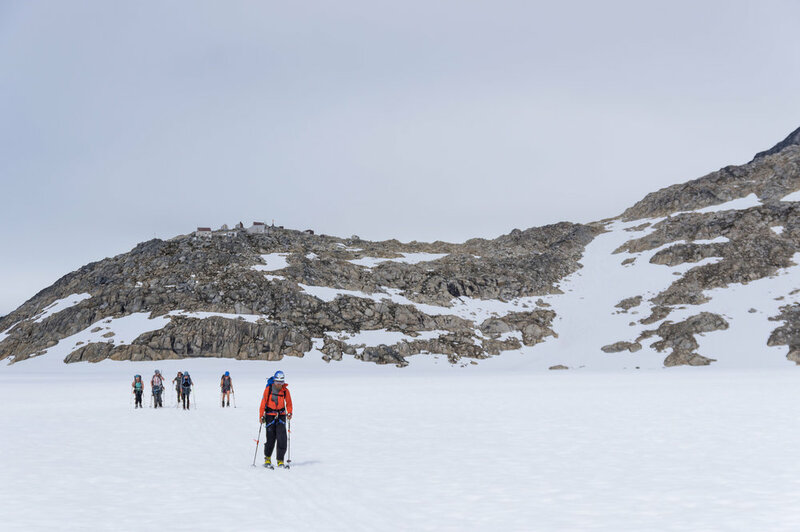 While students and staff are on the Icefield for the entire eight-week program, faculty cycle in and out of the Expedition for 10-14 day blocks. This scheduling streamlines helicopter logistics and breaks up the academic curriculum by camp. Faculty scheduling: We encourage faculty to budget in one extra day in Juneau before their block begins, and strongly encourage two or three extra days in Juneau after their block ends. This helps us accommodate lost luggage, frequent weather delays for helicopters, and the other common logistical complications of getting to and from the Icefield. 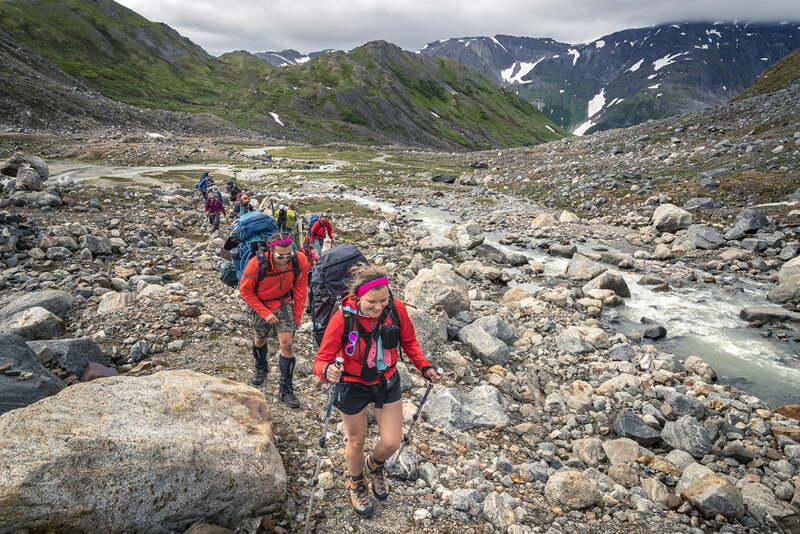 Juneau Week includes a series of warm-up hikes while everyone gets the hang of their gear and working in Southeast Alaskan weather. Photo: Daniel Otto. Students spend five or six days in Juneau doing orientation. The safety staff cover basic backcountry travel skills such as how to pack a backpack; how to layer in a rainy, temperate environment; hydration and nutrition; and blister care. Students do individual gear check with staffers and start familiarizing themselves with how new equipment works. The whole group does some warm-up day hikes- one to a local peak and one onto the blue ice of the Mendenhall Glacier. Faculty deliver the first set of introductory academic lectures. Note that Juneau Week is geared primarily toward students, but we welcome any faculty. Especially early-career faculty new to JIRP or faculty who may not have a strong backcountry background have appreciated attending these days of orientation. Additionally, if you’re traveling from far away, Juneau Week can be a good time to get over jetlag (Alaskan Standard Time is one hour further west than the Pacific Standard Time), organize research and personal equipment, and generally get your feet under you before heading up to the Icefield. Everyone who comes to Block 1 hikes between Juneau and Camp 17 (we avoid transporting personnel via helicopter). The trail up to Camp 17 is a hiking trail (no skiing or cramponing) and covers a variety of terrain from temperate rainforest, through the rocky periglacial zone, and finally up onto the Ptarmigan Glacier itself. Photo: Andrew Opila. The first 10-14 days on the Icefield are dedicated to safety training for all students and any new faculty who elect to participate. The JIRP safety staff fill every day with a series of camp orientations (cook crew, work detail, bunkhouse etiquette, etc. ), general Icefield protocols surrounding risk management and communication, and skiing and mountaineering skills. Skiing lessons are divided by levels and students have the opportunity to change groups ever day depending on their progress. Safety staff teach the basics of glacier mountaineering in small groups so that everyone can comfortably cover harness use, rope skills, anchor building, crevasse rescue, and route finding. We spend as many hours as possible on the glacier every day so that everyone becomes accustomed to working in the sun, rain, wind, and fog, but we are almost always within a short, safe hike of camp. Using a combination of short lectures, group practice, and one-on-one mentorship, the staff work with participants to develop basic mastery of all necessary skills. Towards the end of Block 1 some students will have learned safety skills to a satisfactory level ahead of the rest of the group. For a few days these students will assist with limited research needs on the Lemon Creek Glacier. Research faculty are welcome to work out of Camp 17 for this time, but teaching opportunities are limited. Students have to put their full energy into safety training. Consequently, there is very little time for academic lectures, and even fewer hours available for field trips. We encourage teaching faculty to join Block 1 to get the hang of JIRP and to learn the necessary glacier skills, but please be aware that academic teaching time is severely limited. Camp 17, with Cairn Peak in the background, and Lake Linda and the Lemon Creek Glacier to the left. Photo: Daniel Otto. Camp 17 is located on a ridge between Ptarmigan Glacier and Lemon Creek Glacier, and at a col between Vesper Peak and Cairn Peak. The Lemon Creek Glacier is a fantastic field site for research questions that benefit from being able to consider the entire watershed. The entire glacier is accessible from Camp 17, its mass balance has been consistently monitored for decades, and the stream that drains the watershed, Lemon Creek, is well monitored by the USGS. Lemon Creek Glacier also hosts Lake Linda, a supraglacial lake that often drains (probably subglacially) in early July. Lake Linda has long been the subject of academic discussion at Camp 17 and invited further inquiry. The surrounding mountains and ridges are often field sites for ecology, botany, and dendrochronology research. Many of these sites are within day-hiking distance from camp and present relatively un-technical objectives from a safety perspective. Camp 17 is the easiest Icefield camp to access. The helicopter trip takes only 5-10 minutes, but even so we save this option for groceries and supplies. All personnel are expected to hike between Juneau and Camp 17. The trip, depending on the route, is 8-10 miles, covers 5000 ft/1500 m of vertical elevation, and generally take 6-12 hours (depending on the route and the pace of the group). At Camp 10, the JIRP student program transitions from what we’ve traditionally called “the Institute” - training, training, training - to “the Expedition” - the bulk of the academics and science research. While safety staff still accompany all trail parties and continue to train students in glacier mountaineering, we begin to expect every student to take a more proactive role in making the Expedition happen. Because the team is functioning at a fairly efficient level, we can dedicate most of every work day to academics and student research projects. Two rope teams wind their way home between crevasses after a day of field work in the middle of Taku Glacier. Photo: Daniel Otto. Camp 10 is our biggest camp (it sleeps over 60 people) and has the easiest access to a wide variety of glacial sub-environments. Taku Glacier, the deepest alpine glacier in the world at over 1500 m in the middle and fed by a series of large tributary glaciers, presents ideal field sites for mass balance pits, snowpack research, and strain analyses where the ice flow from different branches merge. A series of vegetated nunataks offer a variety of options for ecology research, and access to head of the deglaciated and forested Avalanche Canyon offers a standpoint for examining glacial geomorphology and more questions about ecology. Finally, two glacial lakes, one subglacial on the north side of camp and the other supraglacial on the south side of camp, present opportunities for a host of glacial hydrology inquiries. During this block the mass balance, isotope geochemistry, and geomatics teams often focus their data collection on covering the Taku Glacier system, the geophysics team chooses (a) site(s) of interest to work on, and the ecology team visits various nearby nunataks. Leaving Camp 10 (visible on the ridge in the background) in the morning is a quick trip. It take ~ten min. to hike down to Taku Glacier. Photo: Daniel Otto. Camp 10 is a twenty minute helicopter trip from Juneau. With this relatively short trip, it is the most easily accessible major research camp in the middle of the Icefield. Camp 10 is also our largest camp with a comfortable dining and sleeping space for up to 60 people. It provides easy (<10 min.) access to Taku Glacier and the Taku B nunatak. Of all the camps and blocks, this is the least logistically challenging for many projects. Camp 18, perched on the Cleaver and overlooking the Gilkey Trench. Photo: Daniel Otto. Camp 18 is, without compare, the most dramatic of the JIRP camps. Perched on the Cleaver, a bedrock promontory rising vertically 2000 ft./ 600 m from the Gilkey Trench, this camp offers unrivaled views of the ice dynamics of the Vaughan Lewis Icefall, the ogives of the Gilkey Trench, and the geomorphology of the walls of the trench as the surface of the Gilkey Glacier lowers. Additionally, a moderate ski out of camp leads trail parties to the upper reaches of the Matthes and Llewellyn Glaciers and the Divide between the two. Mountaineering training at Camp 18 focuses on nearby peak ascents, a culmination of all the technical and team management skills of the summer, and the ever-popular crevasse exploration. 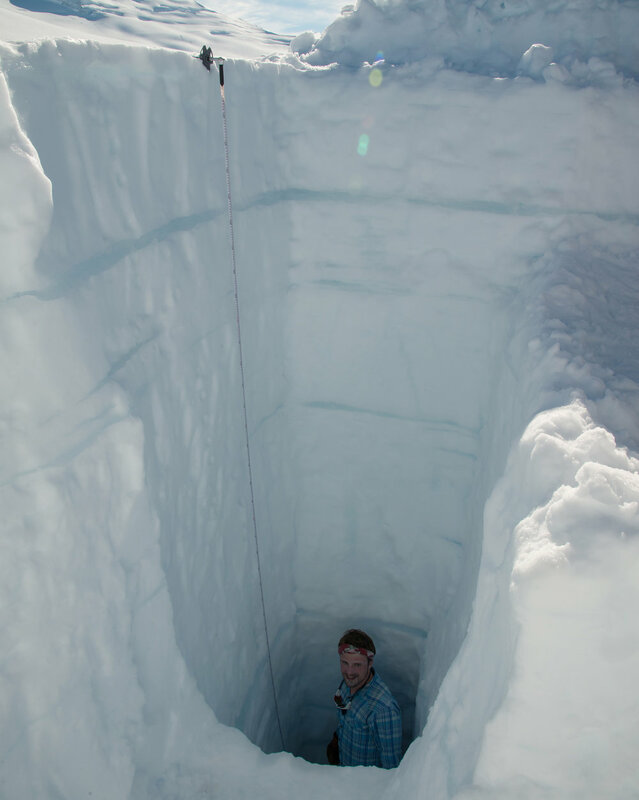 While everyone has a different summer on the Icefield, the safety staff do everything in their power to include every student who wants to rappel into and explore one the of the large crevasses at the head of the Vaughan Lewis Icefall. A fairly typical snowpit high on the Matthes Glacier. Annual net accumulation, even in August, is often 4-5 m and (some years) can get as high as 6-8 m. With teams of six and full-size shovels, JIRP students are accustomed to making quick work of these pits (we dig ~30 of them over the summer). Photo: Ben Huff. Research at Camp 18 is focused on the geomorphology of the Gilkey Trench, the deepest mass balance pits high in the accumulation zone, further exploration of nearby nunataks, and the ice flow dynamics of the Matthes-Llewellyn Divide. Informally known simply as “the Divide”, the remote field camp at the ice flow divide plays host to teams addressing a variety of research questions about ice strain and flow velocity. During this block the mass balance and geophysics teams focus their field inquires on field sites high in the accumulation zone, the isotope geochemistry team and the geomatics team often take the opportunity to explore the surrounding tributary glacier systems, and the ecology team works on the Cleaver. Camp 18 is a 45-minute helicopter ride from town. Because of this, Camp 18 is the most expensive full-size camp to fly to and to supply. Additionally, bunkspace is somewhat limited in camp (capacity is closer to 55), and the main glacier access is a 30-45 minute ski from camp (adding up to two hours to every day when all is said and done). We encourage anyone looking to do research out of Camp 18 to take these aspects into consideration. Camp 26, down in the ablation zone of the Llewellyn Glacier, opens for research a few days after Camp 18. It is on the nunatak of Corona Peak, directly above the blue ice of the Llewellyn Glacier. Below camp, most years, are a series of glacial caves. On the nearby glacier we get the best view of supraglacial streams and (at some distance from camp) moulins of the field season. The biogeochemistry student research team explores a supraglacial meltwater stream on the Llewellyn Glacier. Photo: Evan Koncewicz. Research at Camp 26 often addresses questions about glacial hydrology. There is a wide variety of both supraglacial and subglacial streams, and most years a series of subglacial caves that are safe to explore. For the past several years the biogeochemistry student research team has collected data on meltwater alkalinity from supraglacial and periglacial sources. All three buildings of Camp 26 (other than the outhouse). Camp 26 sleeps max 20 people comfortably indoors, so research teams are generally decided in advance and focused on one project. Photo: Daniel Otto. Camp 26 is a small camp that is relatively complicated to supply. Because helicopters cannot land across the international border and we have a limited field support in Atlin, we supply Camp 26 via snow machine and hiking from Camp 18. Food, supplies, and equipment are snow machined down to the snowline on the Llewellyn, and then everyone working out of Camp 26 packs everything the final 4-8 miles to camp. The camp itself sleeps up to nine staff and faculty and ten students comfortably, and so research parties to the lower Llewellyn are moderately limited. For longer field work campaigns we are happy to discuss more robust support directly out of Atlin, but this might require significant shifts in JIRP resources. Please contact Seth and Annie directly with questions. A final view of the terminus of the Llewellyn Glacier from the trail to Atlin Lake. The traverse section from Camp 26 to Atlin goes through exceptionally beautiful terrain, and includes several things many JIRP students won’t have seen in six weeks: trees, mud, bears, and large bodies of liquid water. Photo: Daniel Otto. Block 4 is different from Blocks 1-3 in that it’s mostly not on the Icefield. This block includes the four-day traverse from Camp 18 to Atlin, five days in Atlin itself, the bus and boat trip back to Juneau, and two days of program wrap-up in Juneau. The academics of Block 4 are focused on finishing the summer goals of student research groups and finalizing the student project presentations. Because of logistical constraints we usually limit faculty to a small group, and it’s critical for all Block 4 faculty to support all student research groups. Much of the academic time is spent on presentation skills and practice; consequently all faculty members focus on more general science support and less on subject-specific expertise. This block requires that participants complete an arduous traverse, so please see the page on traverse sections for more information. Additionally, the Expedition crosses the international border twice during this block (once into Canada, once back into the U.S.), so all participants need a valid passport and participants from outside the Canada and the U.S. may need additional visas. Researching and securing these visas is the individual’s responsibility.